10 Fun Bright Orange Comforters and Bedding Sets! 10 Cool Orange Comforters for Your Bedroom! I love bright orange comforters! 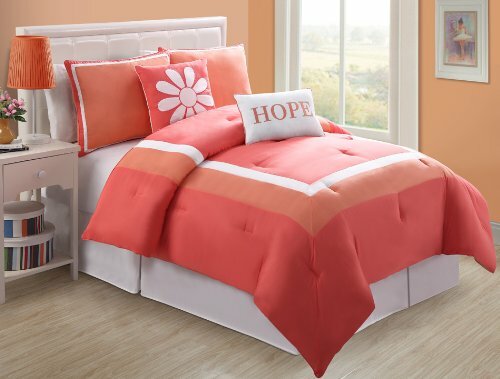 A nice orange comforter set will instantly brighten up any bedroom! Whether you are looking for solid orange comforters or orange mixed with other beautiful colors, you will find them here! I selected the coolest orange comforter and bedding sets sets I could find! Orange goes really well with white, green, fuchsia, pink and brown! I really like experimenting with colors and at the end, there is no right or wrong, just what works for you! Trina Turk 3-Piece Louis Nui Comforter Set, King, Orange and White! Vibrant Orange and White Floral Design Comforter Set! This is a very cute and girly floral design king size orange comforter for your bedroom! Look how ‘happy’ and cheerful it is! Beautiful color combination of orange and white! This comforter is so cute and peaceful! I love the two cute decorative pillows! One says ‘Hope’ and the other has a flower print! Look at that bedroom in the picture… it’s so beautiful! It makes you ‘feel good’, doesn’t it? It’s also very affordable and machine washable! How fun and bright is this very vibrant solid orange comforter set for sale? Very Cheap Solid Orange Comforter Set for Sale! 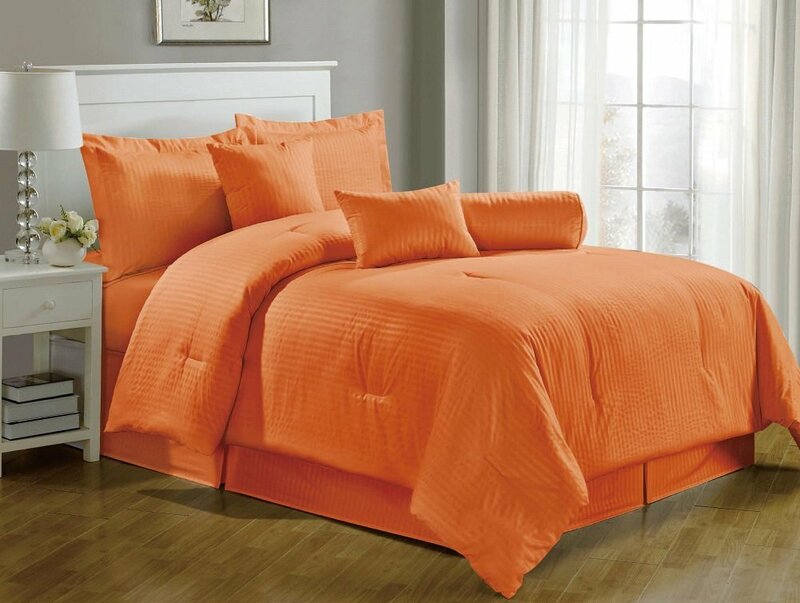 This is one of the cheapest and most fun tangerine color queen size comforter sets around! You will even get the cute orange pillows and cushion too! The quality is amazing for the price! How cool, exotic and unique is this ‘Bohemian’ style orange, brown, yellow and blue duvet cover set? It will immediately put a smile on your face when you put it together! Guess what else is great about this cool bedding set? Do I even need words to describe this amazing 100% Egyptian cotton orange duvet cover set? This is total orange bliss! It also comes with the sheets and pillow cases. 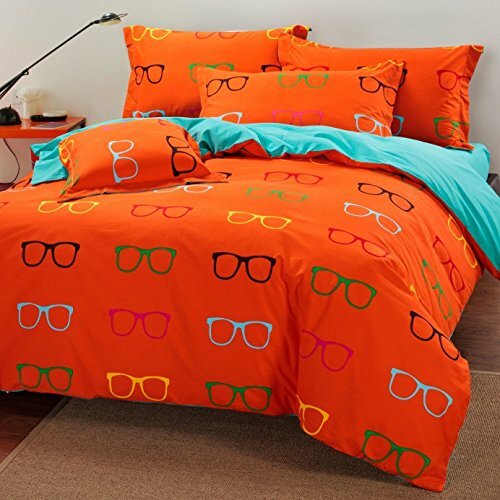 How cool and unique is this bright orange duvet cover set with fun and colorful sunglasses prints all over it? It’s also made of 100% cotton, so it will be soft and comfortable! Perfect for a teenager’s bedroom or dorm room! Very Fancy Orange Stripes Pure Color 100% Cotton 4pc Bedding Set! Are you having fun yet with all these beautiful and very orange bedding sets? Look at this fancy orange stripes 100% cotton duvet cover bedding set! You can get it in twin, queen or king size! 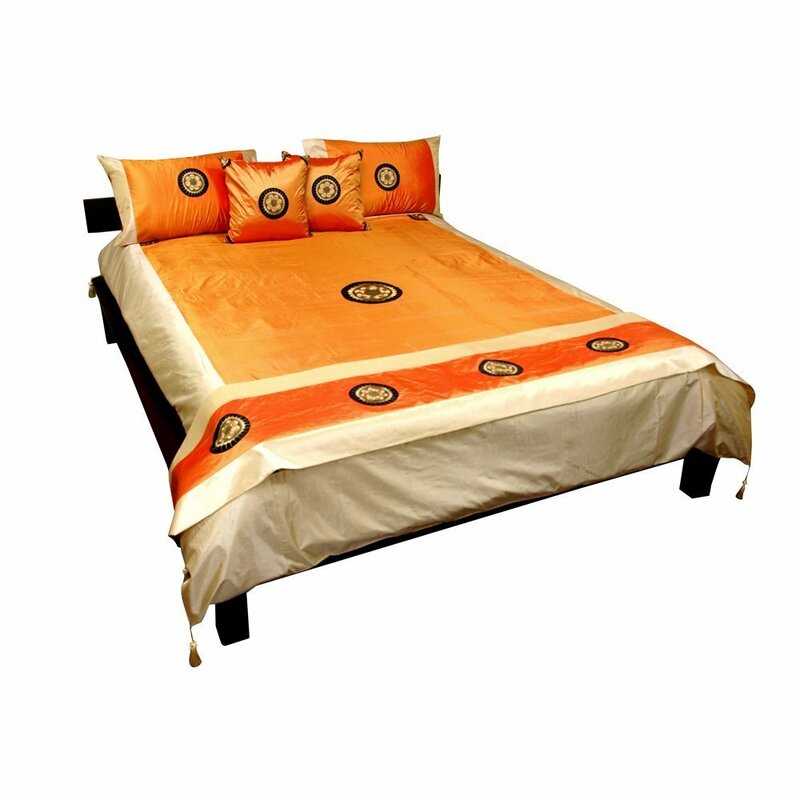 Beautiful oriental style silk orange bedding set for sale! Will transform your bedroom into a very exotic getaway! It comes with two pillow cases and two pillow covers, and also the beautiful bed runner, just like in the picture. 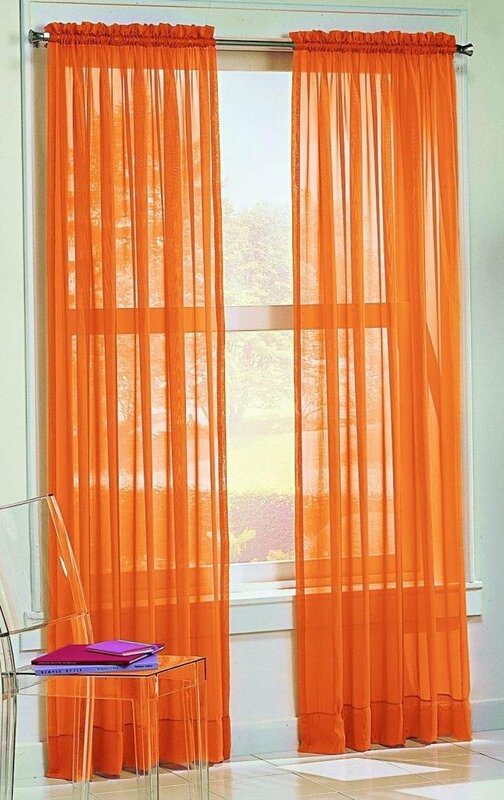 Very Cheap Solid Orange Sheer Curtains! Just add some orange curtains to your bedroom window as well to complete your ‘orange look’!